Before the police begin searching for an unknown crime suspect they first assemble a phantom likeness of the person as an identikit picture. In this way the police attach a face to each case, thereby feeling their way forwards to what is unknown, alien and disconcerting. 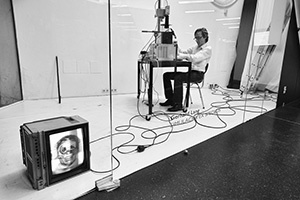 Since the early 1990s Gerhard Lang has been using an old identikit image device, a Minolta Montage Unit as formerly used by the Federal Criminal Police Office (BKA) in Germany. 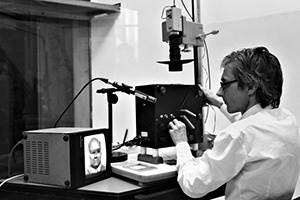 Using this special mirror assembly technology, the police were able to compose a new face from sections of up to four different portraits of detained subjects, an identikit or phantom image. In 2000, Cathrin Pichler and Roman Berka from the museum in progress invited Gerhard Lang to comment on Austria’s first right-wing conservative government coalition between the ÖVP (Austrian People’s Party) and the FPÖ (Austrian Freedom Party). Lang used the identikit device to assemble an image titled The Government (Ill. XIII), which was reproduced in the Vienna daily paper Der Standard. 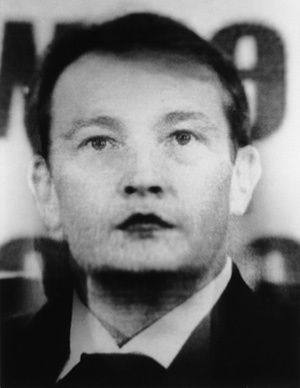 To make this phantom image Lang used press shots of the politicians instrumental in forming the coalition: chancellor Wolfgang Schüssel (ÖVP), vice-chancellor Susanne Riess-Passer (FPÖ) and the chairman of the FPÖ Jörg Haider (www.mip.at/projects/transact). 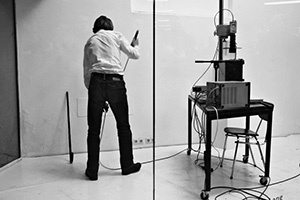 The performance Simulacra ex speculis and the eponymous exhibition were held in the gallery Schauraum Angewandte, which was not accessible to the public. Visitors watched the event through two glass walls. 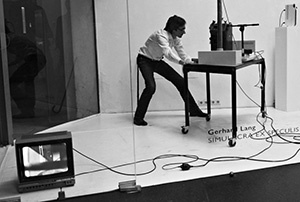 At the beginning of the performance Gerhard Lang entered the space with a walking stick and barred the door. 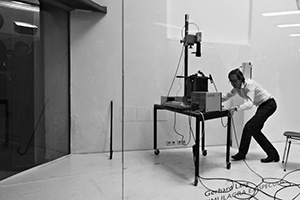 Holding the stick in his right hand and a microphone in the left, Lang scanned the gallery by skirting the perimeter of the space, tracing with his stick a single invisible line along the walls, the glass partitions and a curtain in front of the shelving. 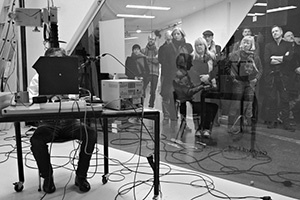 The sounds produced in the process were relayed via microphone to a loudspeaker installed outside the gallery. 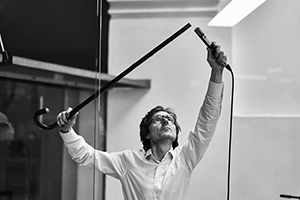 At the point where the traced line joined up with its starting point Lang carefully laid his walking stick, handle first, on the floor, allowing the tip of the stick to maintain contact with the invisible line. Ill. 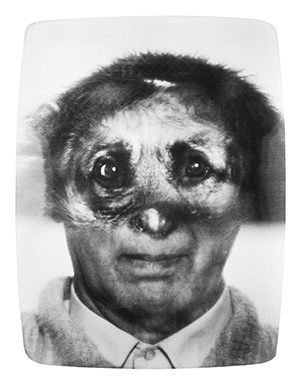 I: While creating the first identikit image. Ill. V: Immediately after putting down the walking stick, with the handle pointing down and the tip maintaining contact with the invisible line. 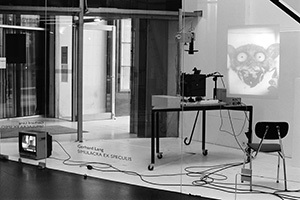 Ill. XIV: Exhibition with the live transmission of the spatial phantom image (monitor) and the film Phantom images (1992/97) being projected onto the glass pane on the right. One element of the exhibition was also the identikit image The Government (Ill. XIII), of which, cropped on the left, the black reverse side of the frame can be seen. 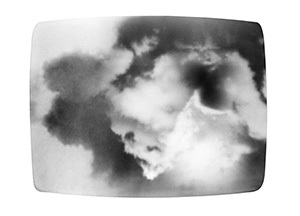 The Minolta Montage Unit was originally designed for the plastic surgical reconstruction of faces of Hiroshima victims. From the 1970s until the mid-1990s the device was employed in search operations by police forces in the United States and in Germany. 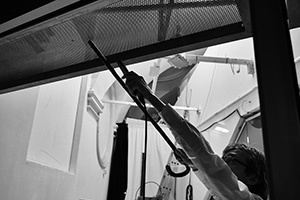 Cathrin Pichler, deceased in 2012, was an Austrian researcher, teacher and exhibition maker. Together with Jean Claire she curated the 1995 Venice Biennale exhibition Identity and Otherness. 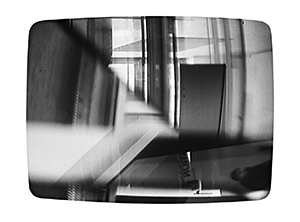 The exhibition Simulacra ex speculis opened with the eponymously titled performance on 28 February 2018 at 7 p.m. The exhibition ran from 1 March until 28 April.